Stylish and practical as women trench coats are, surely everyone has a few pieces of them. But here comes the question that how to style them with other items and what to wear inside trench coats. To answer these questions, I am going to introduce you some trendy women tops that can make your coats even more beautiful. Turtleneck sweater shirt has a bit of vintage style in its nature. And because of its high neck design, it goes well with coats and is able to build a layered fashion in an effortless and chic way. Coupled with a pair of jeans, it can be applied universally and would never be wrong. Trench coat and women blouse are a perfect pair for office ladies in winter. It looks so crisp and stylish, and it is just as formal as women suits. If you pick wide legged pants to match with it, that would be even more chic、elegant and distinctive. Also, leaving your trench coat untucked, to wear delicate blouse and lady skirt inside the coat is a very fantastic and revitalizing way to style trench coats and trendy tops. 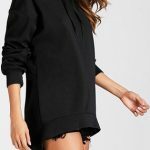 Hoodies is a item that symbolizes youth and energy, so to style hoodies with trench coats is a good idea to make yourself look younger and create revitalizing and chic image. Therefore it is a perfect match for young girls who may be worried that trench coats can be a little bit serious and formal for them. With these trendy women tops, you don’t have to worry what to style with your trench coats.